Planning a royal themed wedding? When it comes to bridal wear, Oh! Wait! Did Sabyasachi just pop into your head? Yes, we too can’t stop drooling over his collection, but giving that thought a rest, what caught our eye at the Lakme Fashion Week this year was Hyderabad designer Anushree Reddy’s Mughal India collection. Each piece an amalgamation of the Mughal era and modern styles merely stole our hearts. From soft pastels to regal dark tones and fabrics used in her collection, such as pure silk, mulmul and fine cotton had all the elements a bride would search high and low for that perfect summer wedding attire. Her collection includes inspiration not just for your wedding reception, but also engagement, mehndi, sangeet, cocktail party, formal family dinners and ideas for your best friend’s wedding celebration. Observe the interesting ways in which she creates elaborate silhouettes and adds surprising embellishments that makes each piece truly mesmerizing. Genius work of a passionate designer, indeed! Here’s a visual treat from us to you. Get inspired! 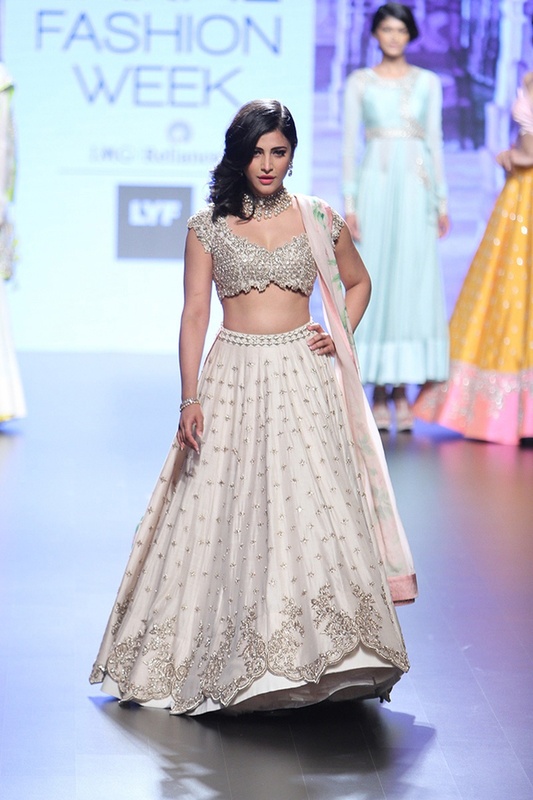 Find more bridal wear inspirations from Lakme Fashion Week, click here. Like what you read? Write to us at content@weddingz.in to give your feedback and suggestions.